There are a seemingly endless number of ways to spend your marketing dollars. Exploring these countless options can feel overwhelming and investing your marketing dollars in new channels can generate anxiety, to say the least. For many small to mid-sized business owners, the options feel too foreign, the unknowns to prevalent, and the downsides of diverting cash from marketing channels that are working too high. They stick with what they know. There’s nothing wrong with this, and in some situations, it’s probably the right decision. The last thing that you should do as a business owner or marketing professional is gamble cash you can’t afford to lose on a marketing channel without an understanding of why and how the channel will grow your brand. In this post, we’ll look at the benefits of spreading your marketing budget across multiple marketing channels and how you should approach making the tough decisions of where to spend your marketing dollars. First things first, you need a budget to allocate. One of the biggest mistakes you can make is to play it by ear when it comes to your marketing spend. You need to establish a clear marketing budget and stick to it. Now, we all know that things will come up that are unexpected, and that’s fine. You don’t want to be so rigid with your budget that you pass on a good opportunity, but you also don’t want to be so flimsy with it that you cut into your bottom line. 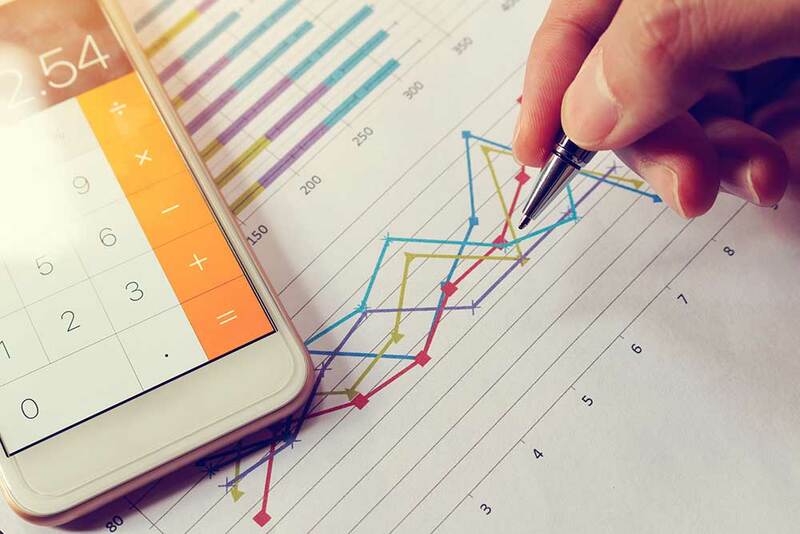 In a previous post we’ve gone into more detail about how to approach setting your marketing budget, so we’ll just take a quick look at it here. Expert opinion varies on how much you should spend on marketing, and it ultimately depends on your industry, product, and business model. Recommendations fall anywhere from 1-20% of gross revenue. The U.S. Small Business Administration recommends spending 7-8% of gross revenue, assuming that your profit margins are in the 10-12% range. As you can see, average marketing spends range from roughly 6% to roughly 15% of revenue, and it’s highly dependent on the business. For this post let’s just assume that your revenue is $100,000 a month and your marketing budget is 10%. That gives you a nice even $10,000 a month to work with as we determine how to spend best to meet your marketing goals. Ok, you’ve got your budget. Why not dump the entire budget into one marketing channel that you know yields a good return for you? You can try that, in fact, a lot of businesses do. There’s only one problem, and that’s the law of diminishing returns. At some point, the returns that you get from any one single marketing channel will begin to plateau. You can keep pumping money into that channel, but your return per dollar will grow ever smaller. Knowing where this plateau point is for your business and any given channel is something that only you can determine, but keep your eyes peeled for the signs including increasing the cost per lead or cost per impression. The concept of diminishing returns on your marketing efforts is a real concern, but the fact of the matter is that by diversifying your marketing spend, you can work to not only diminish but amplify your marketing efforts across different channels. As we become more and more inundated with ads, it takes more and more impressions to… well, make an impression. Using a consistent well-crafted marketing message across multiple channels increases the likelihood that you can cut through the noise. Not every person who comes into your store or lands on your website is in the same stage of the sales cycle. Different marketing channels allow you to speak to the different stages more directly. Video and content marketing is a good fit for the education or awareness stage of the cycle, where digital advertising and remarketing are good fits for the attraction or consideration stage. We live in a world full of choices. Knowing your target audience allows you to take your message to them, where they spend their time. For example, if your target audience is mid-level purchasing managers, you may find that running a targeted ad on LinkedIn before a trade show can boost the number of people who stop by your booth and the number of leads you take away. When you vary your marketing spend across multiple channels, it allows you to maximize the effectiveness of your marketing message and ultimately generate more leads and customers. Need to grow your business? Let our marketing and branding agency in Houston help develop and implement a strategy to increase your top and bottom line today! You’ve established a marketing budget, and you’ve decided to take a multi-channel approach to your marketing, so how do you decide which channels to use and how to divvy up the budget amongst them? As you can see in the chart below, deciding where to put your marketing dollars is an ongoing consideration for marketing professionals. You should revisit your budget at least annually, if not quarterly. 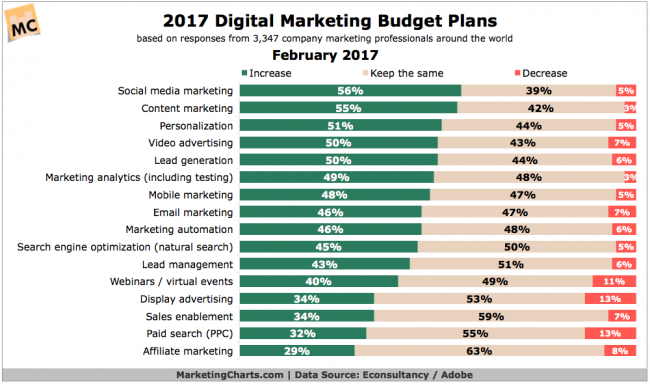 While this chart illustrates very nicely where many marketing professionals are putting their marketing dollars, it may not speak much to your business outside of understanding the current marketing climate and trends. You must first establish what you need to accomplish with your marketing efforts before you can determine which marketing channels are the best fit. If you are a startup with a brand-new product, your focus will likely be on the awareness and consideration stages of your sales funnel. You will need to run campaigns that educate your target audience and entice them into considering your product. If you are an established professional services firm, perhaps your focus is more evenly spread across the consideration, purchase, and retention stages of your funnel. Once you determine your marketing goals, you can determine which channels will best suit your needs and how you should allocate cash to each. Different channels are best suited to different stages. In the chart below you can see how social media and print ad spend don’t necessarily translate directly into leads. 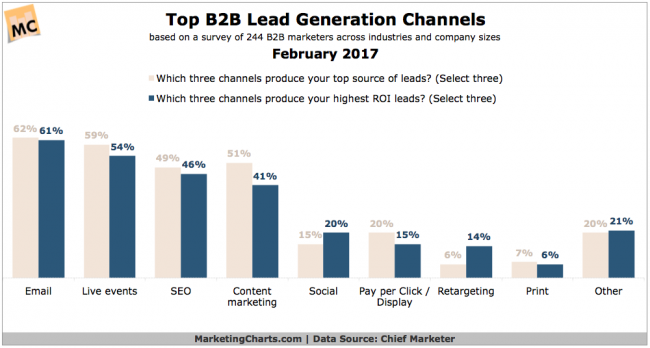 These channels are better suited to the branding and awareness campaigns, while email, SEO, and content marketing have a more direct effect on lead flow. It’s for this reason that the cost of SEO services and content marketing are frequently justified. As you can see, this marketing budget has a healthy mix of marketing channels, both online and offline, that address the whole spectrum of your sales funnel. Obviously, this is just an example and is not intended to represent how you should allocate your budget. Only by carefully considering your needs and available resources can you decide what is a good way to diversify your marketing spend. Regardless of how your budget ends up breaking down, ensure that it spreads across the entire marketing mix and, at least, touches all stages of your sales funnel. A diverse marketing mix can help you deliver the right marketing message to the right people, at the right stage in the sales funnel, and generate higher engagement levels. That said, blindly distributing your marketing across different channels with no thought to the end goal will not serve you well. Carefully consider your business needs and how they are best addressed with your marketing spend to determine which channels make the most sense for your business. Working with an experienced marketing firm to establish your goals and objectives and then determining the best strategies to implement to achieve them is often your best bet.